Description: Available in 4 3/4" and 5 1/2" barrel lengths. Made to fit most Single Action revolvers. Original maker - S.C. Gallup in Pueblo, Colorado. This holster pattern dates to around 1890. 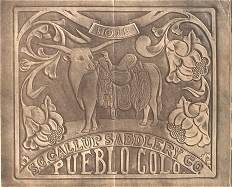 After learning the saddle making trade from his brother, Francis and partner, E.L. Gallatin at their shop in Denver, Samuel Caldwell Gallup opened his own saddlery in Pueblo, in 1869. Between 1878 and 1884, two branch stores were also opened, one in Dodge City and the other in Durango. With the passing of S.C. Gallup in 1904, the shop continued to produce fine cowboy equipment until closing in the early 1920's.